Double portrait of a married couple, n.d.
Oil on canvas, 173 x 132 cm. In this painting, a bourgeois gentleman is portrayed together with his young wife in front of a red drapery and an imposing pillar. The woman’s classy lace cuffs, gold brocade and gold-embroidered lace gloves can be seen as material symbols that help highlight the couple’s high societal status. 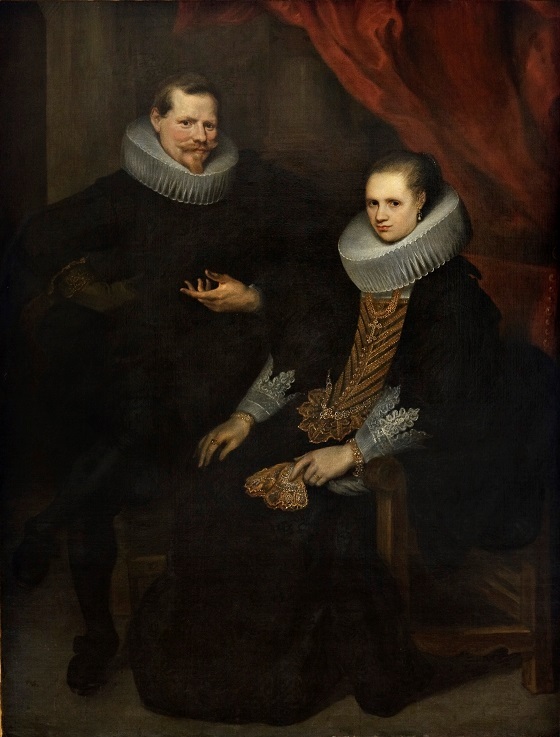 Ruffs were a popular clothing item among the upper classes in the Southern Netherlands. It is likely that this couple were members of Antwerp’s wealthy bourgeoisie. Based on their age and the finely embroidered gloves, this is in all likelihood a wedding portrait.